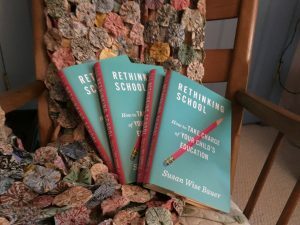 Today’s publication day for Rethinking School: How to Take Charge of Your Child’s Education! So I’ll just be deworming sheep and then heading to the office. When your first book comes out, you anxiously await publication day, expecting floods of congratulatory phone calls, a surprise party, confetti descending at odd moments, choruses of trumpets whenever you walk through doors…and then nothing happens. It’s a bit of a let-down, the first time. But then you realize that what REALLY matters is that the book is out there. And people can read it. And you can keep on working on the next one. So, folks? The book is out there. You can read it. (Check out the links below.) And I’m working on the next one. Yay! Congratulations! Confetti! Seriously, I can’t wait to read this. I know quite a few parents to whom I am going to recommend this book. I just had another conversation on Sunday with a friend of mine who is OVER the way things have been for one of her kids. She marches on, taking the best and leaving the rest with regards to guiding her teen through his high school years in the school system. I know she will love this book. Amazon said my package was delivered today…woohoo!!! Can’t wait to get home and dive in. I heard you mention it on (I believe) The Read Aloud Revival podcast. I’ve been following your lectures and books since my 5th grader was in kindergarten. But I work full-time so I could never take full advantage of your materials. I’m hoping this book will give some insight on how to educate our kids within the school system and things to make the experience better. I’ll update you after I read it. Thanks for your contributions to education.